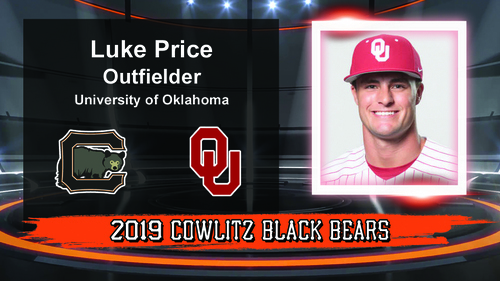 The Cowlitz Black Bears are happy to announce the signing of University of Oklahoma junior Luke Price. Price is a talented outfielder who covers a lot of real estate and has a cannon for an arm. His skills will surely benefit the Cowlitz Black Bears at David Story Field this summer. Price’s bat may be the most exciting part of his game, as he creates serious electricity in his swing. “Luke will bring with him the gap-to-gap power we'll need to drive in runs or set the table for us in one swing,” Head Coach Grady Tweit said. Price is from Dover, Arkansas, where he played at Crowder College before landing in Norman, Oklahoma, now playing for the Sooners. “I’m very excited to get Luke up here for the summer after talking with Coach Bonneau about him,” Tweit said. Black Bears country, please join us and welcome Luke Price to your 2019 Black Bears!